Campuses are the citadels of progressive ideals which sing the songs of the dark time in India. The political support extended by the student community of the English and Foreign Languages University, (EFLU) and Pondicherry University, has once again demonstrated this. The victory of students’ federation of India, SFI in EFLU and Pondicherry University in last week is not merely a result in a campus poll but a strong political statement which the students of this nation are eager to send to the public. This inspiring triumph has to be seen as a continuation of the thumping victory of SFI in Hyderabad Central University and Kerala Central University this year. With these results, SFI has emerged as the leading force in students’ unions in four of the seven central universities where democratic elections are being held in India. Even though the democratic platforms are suppressed and banned in the majority of the central universities, the students choose democratic and progressive forces as their representatives wherever they have an option. It is also a strong rebuttal to the entirely false and fabricated notion ofa Modi wave among the youth and students and is a befitting reply tothe saffron brigade’s campaign of the ‘Gujarat model of development’as what the future generation of India is waiting for.The democratic sections in the country are looking at campuses with much more hope and expectations than ever before in the recent past. Students’ Federation of India, SFI moves to its 15thAll Indiaconference after winning the confidence of the student community at large through the conclusive victories one after another in a raw. Both the varsity poll results reflect the long struggles waged in the campuses over the question of campus democracy and student rights. It was Allied Students' Action for Democracy-EFLU; ASAD-E backed by SFI that swept all seats in the EFLU. ASAD-E is a larger platform of democratic sections in the campus which questioned the attack on democratic rights of the students in the campus. Tony Sebastian is elected to the post of president and Ajay Mathew (SFI unit president in EFLU) is elected as general secretary. Tania Kar (Vice President), Noble Antony (Joint. Secretary),AnasRahman(cultural secretary) and Ashish Krishna (Sports secretary) are the other members in the union. 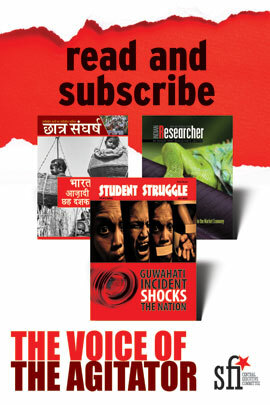 Tania Kar, AnasRahman and Ashish Krishna are unit executive committee members of SFI. It is a rejection of the regressive view thatUniversities is the spaces to silently listen the lectures and mug up information. The administration was forced to hold the election after a gap of one year without any elected students’ body in the campus. The way students had to tread till they reached the day of elections had never been smooth. It was only one week before the election that disciplinary actions were taken against 11 students including many SFI activists over their participation in a peaceful protest demanding students’ body elections in university. Ina deliberate attempt to curb the strengthening of the movement all those 11 students were barred from contesting students’ union elections when it was achieved after continuous struggles and interventions by the students including them. One another student was also served with a show cause notice few days before for his Facebook post criticising the 'SwachhEflu' programme sponsored by the administration. These incidents are not isolated ones in the campus. It has been for a long time that the developments in EFLU have become a matter of shame to any democratic polity. The questions were being replied with a brutal repression of democracy. The demands for the space for debates were met with authoritarian diktats and autocratic orders to keep mute. 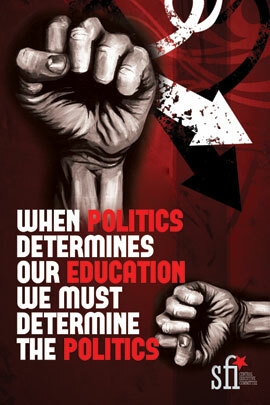 Campuses must be upholding the high values of democracy and promoting democratic platforms. It has been a scene of inspiration that instead of taking out a victory rally the students decided to wage a struggle under the leadership of newly elected union against the unjust disciplinary actions on students in EFLU. SFI was awarded with a decisive victory by the student community of Pondicherry University.All the regressive and caustic agendas of ABVP, who won the student body election last year, allying with the anti-student administration, have been utterly rejected by the vibrant student community of the Pondicherry University. 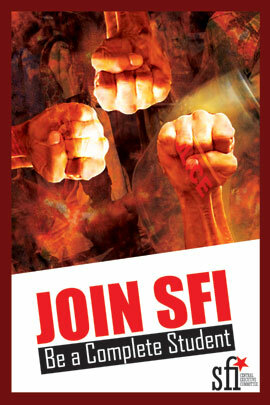 SFI had emerged as the single largest organization in the students’ council election held on 23rd November. SFI-ASA alliance won all 11 seats in the University union to which election was held three days after. Elenkeswaran and Jishnu EN (Unit President of SFI) are elected to the posts of President and General Secretary respectively. SFI Unit committee member Com. Anjali S won unopposed to the post of vice president. Com. Theyventhiran is elected as joint secretary. Regon, Medha Ramesh, MedhaSurendranath, Harsha, Vinoth, ThamizhKalayarasi are the newly elected executive members of the students’ union. It is the first time in the history of the campus, that the white flag occupies the sky of triumph in student body elections in Pondicherry University. This should be seen as the continuation of a series of struggles that were fought in PU over the last few years. 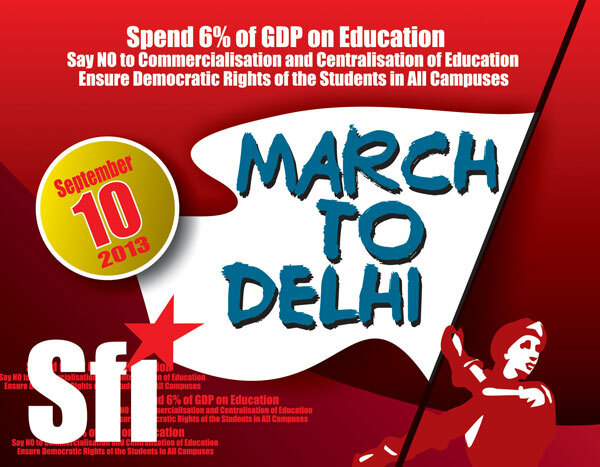 Since its formation few years back, SFI has been in the forefront in raising the issues of students and questioning the irregularities in the university. The yearlong fearless movement which started in 2013 against Ragging and Sexual harassment is what brought PU to the notice of the democratic circles in the country. Many SFI activists were served with disciplinary actions over their active engagement in the struggle against ragging and sexual harassment. They were also brutally beaten up by the goondas backed by administration. Two brave girl comrades, Vidya and Kavya, were suspended from the campus for complaining against such atrocities and for deciding to protest. It was only after an yearlong political and legal battle, with a favourable verdict from Madras high court those comrades could complete their course. The judge while appreciating the two girl students, said they ‘stood to their ground and refused to tender unconditional apology’ as per the order of vice-chancellor Chandra Krishnamurthy and pointed out that their action ‘showed their courage of conviction and a refusal to comprise at the cost of honour’. He lauded them for overcoming the normal tendency and temptation of lesser mortals especially girl students, whose whole career as well as life may be at stake, to surrender to the power of authority. It was only a few months after the court criticized the PU authorities over their highhandness over the student's rights that anotherstrong agitation was launched in the campus demanding the removal of Vice Chancellor, Chandra Krishnamurthy who has submitted fake bio-data to gain the post. Citing the indefensible irregularities in the university after her appointment as VC, the students intensified the protest day by day and it received immense support from various corners of the country. Threats one after another, police lathi-charge, arrests and all other efforts could not stop the advent of the students raising the slogans of democracy. The central government was forced to send the VC on a compulsory leave. ABVP, the union office holders of last year was hiding under the caves of deep silence all the while students came to streets to protest on genuine issues. The busy streets of Mumbai came to a halt few days back as the last rite of Yakub Memon saw a major turn up of people. Though the identity of every single individual is not known to anybody, by looking at the pictures of the procession, one can easily make out that most of the people present there were Muslims by faith. Without even wasting a single a minute, the R.S.S. started circulating some of those pictures on social media, claiming it to be the ultimate proof of Muslims in general being ‘affectionate towards terrorists’. Shri. Tathagata Roy, veteran BJP leader of West Bengal and the present Governor of Tripura went ahead by not one, but quite a few steps to make a ridiculous comment that all of those attending Yakub Memon’s burial are ‘potential terrorists’. What the disciples of Nathuram Godse conveniently chose to forget was that this was not the first time that India saw people thronging the funeral of a condemned individual. Three years back, the same old streets of Mumbai saw flood of people grieving the death of Bal Thakrey, the man who orchestrated the killing of hundreds of people during the Mumbai Riot; the only difference being that three years back the colour of the procession was saffron. But at that time not a single sane person thought or stated that the people who gathered in Bal Thakrey’s funeral could be ‘potential rioters’. Majority of the people who assembled then were the ones whose wrong beliefs and regressive consciousness had made Bal Thakrey appear as ‘Hindu Hriday Samrat’ to them. Disciples of Godse would always try to propagate these wrong beliefs. But the job of the left and progressive forces in the society is to try and fight the forces of regression to cultivate the culture of scientific values and ideas in the minds of people and in the society as a whole. Jawaharlal Nehru wrote in his autobiography that while communalism of the minority is easy to be recognized, communalism of the majority can often take the camouflage of nationalism. And what we are seeing today in the events that are taking place surrounding the capital execution of Yakub Memon is the exercise of this very concept of aggressive nationalism. 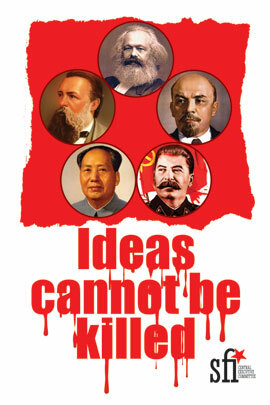 There are many who believe that capital punishment is too primitive an idea to exist in modern human society. Several opine that Yakub Memon, not being the main conspirator in the bomb blast incident, did not desrve death penalty. Again, many including B. Raman, the former RAW officer who took Yukub Memon under custody, believe that since he surrendered and provided valuable information and evidence to the investigators, it should have been considered as mitigating circumstance to exempt him from capital punishment and be given life imprisonment instead . But one thing is clear. In case of Yakub Memon the debate was between death and imprisonment till death. The debate was never between death and acquittal. So to say that all those who are criticising the hanging are actually in favour of giving safe passage to terrorists, is a characterized effort by the saffron brigade to spread deliberate falsehood. However, in spite of all the debates, what apparently remains true is that Yakub Memon was a man involved in terrorist activities. He was a participant in a heinous act of crime against humanity that killed hundreds of people. He was no holy soul on earth whose mortal remains has to be grieved upon by thousands of people. And here perhaps lies the most important of the questions that this entire episode has raised before us. Then why did we see what we saw? Why did the streets of Mumbai get flooded that day by thousands of people, who are as ordinary citizens of this country, as anyone else? What we all know is that the Mumbai Bomb Blast in 1993 was a reaction to the infamous Mumbai Riots that happened in the previous year. And this is not a theory that has been put forward by the leftists or anyone else. Rather it is a specific conclusion that has been laid down in the report of Justice B. M. Srikrishna Commission that was formed by the Government of Maharashtra to investigate into the Serial Bomb Blast. However, the responsibility to show the reaction to the riots did not lie with Yakub Memon and his aides. What they did was an act of terrorism. The responsibility to react lies with the government. The responsibility of bringing the rioters to book lies with the judiciary. In one word, it is the duty of the state to prevent riot at every corner of the country and to ensure suitable punishment to all those who architect riots, irrespective of their religious identity. 23 years have passed since the banks of the Arabian Sea witnessed one of the worst communal violence of 20th century, where more than 900 people got killed and thousands injured, majority of them happening to be from the Muslim community. Today if someone who had lost his or her kin in the riot stands up and asks, how much longer he or she will have to wait to get justice; the answer doesn’t seem to be ready with the state. And the question is not only of the personal emotion of someone who has been a direct victim in the riots. Outside that ambit, there remains a vast section of the population for whom uncertainty is created everyday by the series of events, as they unfold. When the demolisher of Babri Masjid becomes the Deputy Prime Minister of India, when the main perpetrator of Mumbai riots is given state funeral, when a person climbs up mounds of dead bodies in Gujarat to hoist the tri-colour from the ramparts of the Red Fort, the creation of this uncertainty becomes inevitable. That these people might ever get punished for their crimes seems to be a bizarre idea. Within two years after the riots, BJP-Siv Sena alliance got elected to form the government in Maharashra, riding on their electoral promise to ‘safeguard the Hindus’. The first thing that they did after assuming office was to throw away the Srikrishna Commission report into the dustbin. The commission had recommended action to be taken against policemen whom they found guilty of facilitating the riots. Every such policeman was exempted by the government and some were given promotions as well! And Bal Thakrey, who was supposed to be landing of in jail for perpetrating riots, became the de facto chief minister and supreme controller of the government. And the survivors of the riots had nothing to do but to watch these developments with sigh of helplessness. It is natural for a person, who has directly or indirectly been affected in any incident of crime, to possess a subjective opinion about the nature of intervention of the state. But when someone who has been serving at the highest level of integral state machinery like the judiciary complains of “state bias”, it underlines the fact that something is horribly wrong with the way the system has been functioning. A small piece of statistics might attest the apprehension raised by many like Justice Srikrishna on the role of the state. In the Mumbai Bomb Blast incident where 257 people got killed, 100 have been convicted and one has been served capital execution. And in the Mumbai riots where more than 900 people died, only 3have been convicted and the punishment ordered for the convicts was one year of imprisonment. It is because of this one sided approach of the state that several people lose their faith in the system. Some get driven to believe that sooner or later they will be facing atrocities as well. No one is there to save them. And the state is not going to ensure them justice. From this disillusionment towards the system takes birth one kind of panic and insecurity that makes the Yakub Menons messiah in the eyes of some people. “The state did not punish those who killed my child. Rather, they were given gun salutes. May be the path that Yakub Memons took was wrong. But at least they had taken my revenge”. This way of thinking has devastating consequences for the society. But century old wrong beliefs on one hand and relentless build-up of fear and insecurity on the other hand shall force some people to think this way. So whether one likes it or not, if the role of the state characterise bias, the Yakub Memons will become ‘icon’ for some people in the society. The darkness on earth will get deeper. ‘All the day, all the night-occupy UGC’has become a popular slogan these days and is reverberating in the university centres across the country. This slogan emerged out of students’ anger against the decision of UGC under the direction of MHRD to discontinue the non-NET scholarship. Though there is an immediate economic demand of the students community which triggered this movement, the scope and scale of the movement has become much large than the immediate concern. The struggle now is not merely against the particular decision. Rather the agenda now is to save the research in Indian universities and research institutions from the clutches of finance capital and its diktats. What is at stake hence is the very idea of ‘research’ and the ‘research scholar’. For growth of any nation and equal development of all sections of society,country should know its problems and possible solution. It is equally true for problems of society as well as problems of science and technology. To serve this purpose basic research in humanities and sciences plays an important role.Through basic research in humanities and science we can address our problems of hunger, poverty, social evils, health etc. This basic research is the mandate of our research institutions and universities. Universities play a greater role and are very important in progress of any nation. They are not merely the degree awarding centres but the centre of developing the national builders. According to the Dr. SarvepalliRadhakrishnan ‘universities are known for the creation of knowledge.’ Universities by definition are centres of critique, and questioning hierarchies and the status quo is central to that process. In these research institutes and universities there are thousands of research scholars who are involved in research under M.Phil. and Ph.D. courses. It is the duty of government to support these research scholars financially as research work is a long term process and needs immense patience and concentration. These students are at such juncture of life where they are concerned about their livelihood as they cannot ask for it from their family. And the hard reality is that most of their families are not in a condition to support them in this working age. They are involved in social research which is aimed at social welfare so state is required to support them only then they can whole heartily give hundred percent in an honest and genuine research. For this support in university there is a provision of fellowship offered by UGC and CSIR which constitute major portion of all the available scholarships. To avail this scholarship students have to qualify examination conducted by CSIR and UGC twice a year for JRF/SRF. But reality is that this examination ‘eliminates’ more people than it ‘selects’, this process is also questionable and its main aim seems to eliminate students out of the channel of research rather to provide them opportunity. This examination is based on multiple choice questions and students have to choose one right answer out of given options. Various studies have indicated that success depends upon the cheap guides available for clearing the exam have shown that not all students showing research aptitude or skills qualify the exam. Those who can afford coaching with a high cost have a better chance to qualify the exams. It does not mean that all who have qualified JRF are not capable. But this is also true that success in these exams depends more upon such quickfix skills to choose an option. Those who are unable to qualify these exams and make a way to so called ‘Merit’ are unable to pursue research and for them doors of research are closed forever. For all those students these non-NET fellowships provide a welcome breather. They get a monthly grant of 5000 and 8000 rupees for M.Phil. and Ph.D.respectively. This amount is given to Ph. D students for a period of four years and to M.Phil.Students for 18 months.In addition to this they also get annual contingency fund to purchase books, journals, for printing and photocopy purpose. This is a very small amount but is very crucial and serves as life line for research scholars whose research careers are saved. In this scenario this decision of UGC will adversely impact the research scholar as well as research of India. Researchers from deprived backgrounds will be the most hit by the new decision as should be obvious. Especially in the case of women researchers, the lack of financial independence makes them susceptible to familial pressures to leave research. The overall result would be the weakening of research in the country, undermining its knowledge base and intellectual self-reliance even as it makes research degrees inaccessible to the deprived sections of society.According to the UGC’s figure more than 35, 000 scholars are pursuing research under this non- NET fellowship. It means after decision of UGC India will lose these potential scholars of future. It looks like that these steps of government are the part of a broader economic policy followed by the NDA government to leave all things under the control of market, which include research and education also. Now they are targeting research also. Government is directing research institutions and universities to generate funds for research at their own. At the time when UGC is facing resistance of students against this infamous decision during this time news came about the direction of the Ministry of Science and Technology to Council of Scientific and Industrial Research (CSIR) to generate half of the funds for its labs themselves. Labs are directed to collaborate with industries and market for joint research ventures. Ministry has directed in so called ‘Dehradun Declaration’ to emphasise on ‘Research for profit’ for next two years and had signed up to “develop a revenue model in a businesslike manner with a clear cost benefit analysis. In this meeting of officials of ministry and scientists of CSIR, an organisation of Rashtriya Swayamsevak Sangh (RSS) was present in the meeting on June, 6. What is more worrisome that they were not only present there but actively participated in the discussions to ensure the idea of ‘indigenous science’. These directions mean that research in universities and research institutions is left on the mercy of market. They have to take up projects funded by private funding agencies and private companies. Universities also have to follow the same route to support their research scholars and research. When funding will be coming from this route then priority of research will be decided by these funding agencies. Priorities of state and general public interests will not be in focus of research in future. This raises basic question on the very aim of the research. State of research is in a pathetic condition in India. Innovation and creation of new knowledge are the major areas in which universities in the developed countries have an edge over their Indian counterparts. At its present stage of growth, India and other developing nations require knowledge based development of areas like pharmaceuticals, biotechnology, Nano Sciences, healthcare, genetics, IT etc along with studies in humanities. An alarming trend is the decline in India’s share of world’s research, which stood at 2.2% in 2007, a reduction from 2.3% in 2002. A study on India’s research output by Thomson Reuters in 2010 has estimated India’s global share of scientific publication to be about 3.5% for 2010. On the other hand, China’s share has increased from 14% to 21.1% during the period under study.The number of PhDs produced by India is less than half of those in USA. China’s steady increase in PhDs is worth noting; in 2002 India and China were not too far apart in the number of PhDs. However, by 2007 China had surged rapidly ahead in terms of its research output and is now almost rivallingUSA. Comparison of Indian performance with respect to SCI publications compares favourably with many other emerging economies but not China. Countries like Korea and Brazil are growing their research outputs at higher rates. Therefore, it is important for India to scale up its R&D effort engagement if it has to have a relative advantage over other emerging economies. This is the need of hour to Intensify and expandthe research oriented higher education in the university system. Such intensification and expansion would be possible through the infusion of massive public investments that would ensure quality and help larger number of aspiring universities to excel instead of remaining limited to relatively small and specialized research oriented institutions.However, both the above-mentioned decisions are contrary to this. This can be seen as nothing but India’s preparation for WTO-GATS meeting to be held in Nairobi in December 2015. However, the good thing is that these anti-student efforts of central government will not be successful. After the decision of UGC, students from all over Indian universities came to protest against this decision. Protesters included not only research and PG students but students from all courses and classes. Along with central universities, students from state universities are also raising their voice against this decision. Delhi became the centre of the agitation and ‘Occupy UGC’ has emerged as a symbol of protest. Student organisations across the political and ideological lines, came together to wage a decisive struggle. Though absence of ABVP is understandable who first tried to disrupt the agitation, but after seeing full support of students for this struggle, planned to dilute the movement through a fixed meeting with the HRD minister. They were propagating about some promise of minister but agitated students decided to carry forward under the banner of JNUSU, SFI, AISA, AISF and AIDSO. They were thrashed by police twice but were not frightened by the terror of police. During this lathi-charge Delhi state secretary of SFI Sunand, State committee member Prashant Mukherjee, Najeeb, Suresh and Deepanjan Krishnan were severely injured. At the time of writing these lines students were occupying UGC for few days. Students from various universities are spontaneously and voluntarily coming and joining protest. Teachers unions, academicians, social workers and politicians are also coming to venue for solidarity. At a time when society is being dividedbased on caste, religion, dress, food etc. these agitators are presenting a unique example of unity and struggle with full conviction of victory. 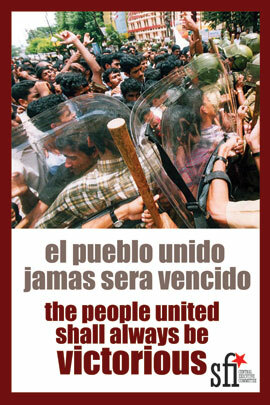 It is the responsibility of all progressive and democratic people to extend their support for this struggle. In April 2015, an anonymous letter arrived at the Indian Ministry of Human Resource Development (MHRD). The letter came from IIT Madras, one of India's premier engineering schoolslocated in southeastern Tamil Nadu State’s capital city of Chennai. It complained that a student group on campus created "hatred among students in the name of caste." The letter also accused the group of being “politically motivated” to "create hatred against the prime minister and Hindus." The group in question is the AmbedkarPeriyar Study Circle (APSC), formed a year earlier. APSC’s invocation of Ambedkar and Periyar, both strident critics of Hindu casteism, reflects the group’s political orientation. The APSC Facebook site records a range of events that it has organized responding to the Indian government’s policy directives. This current government, led by right-wing NarendraModi,requires central government institutions to celebrate a Sanskrit Week, establish separate dining halls for vegetarians and non-vegetarians, and adopt Sanskrit name boards for campus facilities. While the APSC criticizes these measures as part of the government’s broader Hindu nationalist agenda, it defends its events as opportunities to facilitate discussion and debate. Not only do the anonymous letter writers criticize the APSC of being troublemakers. IIT Madras’s Dean of Students, too, took issue with the group. In June and September 2014, he objected to the “polarizing” effect of the names Ambedkar and Periyar. On May 22, 2015, he went even further. A day after receiving a letter from the MHRD expressing concern over the APSC’sactivities, the Dean de-recognized the group. The Dean and the letter writers share two key assumptions: that the political activities of the APSC were unprecedented, and that caste politics has no place in the fifteenIIT campuses. But did the APSC bring the politics of caste into a space where it did not exist? Was IIT Madras previously caste-free? As an anthropologist currently investigating caste and meritocracy in the IITs, I see the history of the institution differently. Caste and casteism have shaped IIT Madras for a very long time, generally to the benefit of upper castes. The assumption that IIT Madras is beyond caste partly rests on the representative weight of the “general category,” or students who fall under the open admissions process. Until 2008, it made up 77.5 percent of the student body. Because of the administrative distinction between the “reserved,” or “caste-based” quota,and “general,” or “merit-based” admissions, the general category is often perceived as caste-free. But who falls under the general category and what is meant by merit? Tamil Nadu’s history of engineering provides some answers.In the 19th century, most engineers in India were European. Asthe profession was indigenized, upper castes who had long enjoyed the privilege of education and bureaucratic employment became disproportionately well represented in it. By the 1920s, Tamil Brahmins made up 70 percent of seats in southeastern engineering institutions, despite being barely 3 percent of the total regional population. In response, the rise of regional Non-Brahmin and Dravidian movements called upper caste cultural, economic, and political power into question. They also identified Brahmins as the principal beneficiaries of caste privilege. Today, Tamil Nadu is known for its highly politicized non-Brahmin majority, the predominance of regional parties emerging out of Dravidianism, and far-reaching institutional reform through reservationsin education and employment.Most regional engineering colleges now reserve up to 69 percent of their seats for three socially disenfranchised groups: Scheduled Castes (SCs), Scheduled Tribes (STs), and Other Backward Classes (OBCs). These measures have democratized caste access to the engineering profession. Amidst these transformations, the founding of IIT Madras in 1959 by the central government was propitious for many Tamil Brahmins and other regional upper castes. Affiliation to a prestigious central government institution allowed them to leapfrog over the region’s progressive reservations policies and secure their educational status. It was in keeping, too, with a longer historical connection to the central government seen in the overrepresentation of upper castes in central government services. Even the makeup of central government schools in Chennai shows a disproportionate number of upper caste students, another sign of their extra-regional alignment. Within Tamil Nadu, these schools happen to also be the principal feeders of IIT Madras. Not only students, IIT Madras faculty too are overwhelmingly upper caste with 464 professors drawn from the “general category” and only 59 OBCs, 11 SCs, and 2 STs. Rather than caste-free, then, the “general category” at IIT Madras clearly comprises beneficiaries of caste privilege. Indeed, most IITiansassume that the “general category” is upper caste, which only proves how entrenched the equation between caste and merit is for them. Although their claim to the institution is made in the language of merit, upper caste students and faculty understand IIT Madras as meritocratic in large part because of its association with them. In other words, upper caste affiliation and a defense of caste interests are at the heart of such claims to merit. IIT Madras’s caste culture is apparent in the everyday workings of the institution andin the opposition to reservations. SC and ST students started attending the IITs in the early 1980s after the implementation of the 1973 SC/ST quota of 22.5 percent. Their integration into the campuses was far from smooth. Students who gained admission through the quota encountered innumerable instances of everyday discrimination that called their intellectual and social worth into question. In my interviews with upper caste graduates from the 1980s and 1990s, theyfrequently mentioned how “the SC/STs did not fit in.” There were a number of explanations for this supposed bad fit, from their poor academic performance to their provincial dress style and poor command of English. Indeed, even grades were interpreted differently depending on who earned them: “general category” students got poor grades because they were too busy having fun while “SC/STs” did because they were not intellectually capable. Therecent spate of suicides and attempted suicides by SC and ST students across the various campuses speaks volumes about the routine slights and indignities they suffer. Backward Caste students spoke of a more ambivalent experience at IIT Madras. Before the implementation of the OBC quota in 2008, those who got admission through the general category spoke of how invisible they felt. Given the assumed equation between the general category and being upper caste, their classmates automatically assumed them to be upper caste. They quickly learned to play along by not expressing adverse opinions on issues such as reservations or Tamil politics. When I asked why they felt the need to do so, they told me that this was how you “fit” into the institutional mainstream. In contrast to these experiences of alienation, upper caste students spoke of the campus as a space where caste, religion, and other markers of identity simply did not matter. Here, they told me, we’re all just IITians. This upper caste sentiment is the background assumption that makes the APSC appear to be bringing caste into a previously caste-free space. But the disavowal of caste by those who enjoy its benefits must be understood for what it is: the comfortable occupation of the mainstream by those who do not bear the stigma of difference. 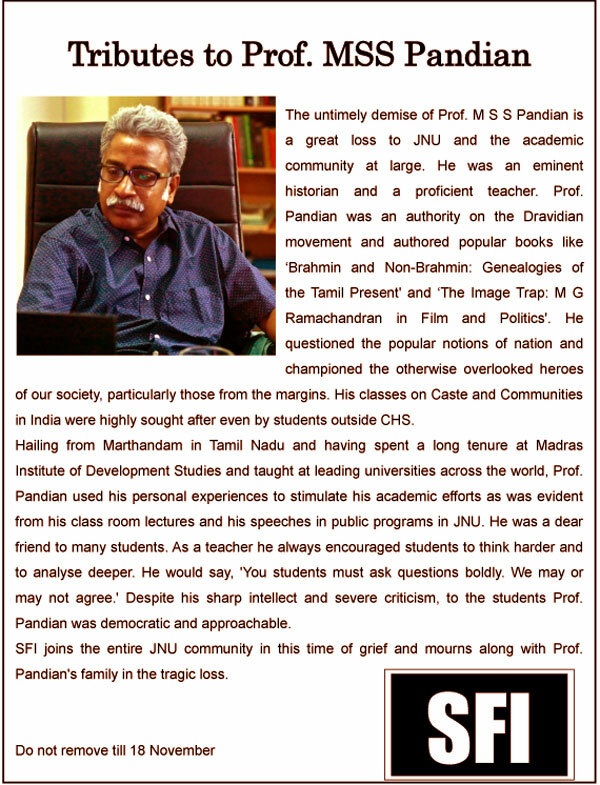 At times, the caste feeling underlying this identity of “IITian” was clear – for example, when Tamil Brahmin students spoke of the campus as a second home where the large numbers of Tamil Brahmin faculty embraced them as extended family. 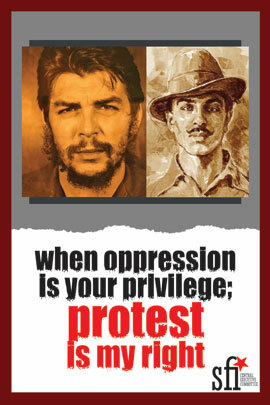 The expression of upper caste identity and interest are most evident in the opposition to reservations. In 2006, theIndian Supreme Court mandated a 27 percent quota for OBCs in all central government institutions. The verdict sparked mass protests within the IITs. SeveralIITMadras alumni recollected that the protests against OBC reservations were overtly political. Moreover, the administration not only permitted but tacitly endorsed student demonstrations against government policy. Students were even warned not to take their protests outside the campus gates where they were less likely to be tolerated. In addition to campus protests, many IITians joined Youth for Equality, an organization formed in Delhi to oppose the 2006 reservations. This is only a recent instance of IITians protesting what they perceived as interference in the institutes’ meritocratic functioning. When the 1973 quota for SCs and STs was extended to the IITs, one of the most vocal opponents was P. V. Indiresan, director of IIT Madras from 1979 to 1984. In his 1983 Director’s Report, Indiresan drew a distinction between “the socially-deprived” who demanded “special privileges” and “the talented” who deserved “rights of their own.” For him, and many with similar views, upper castes are simply “the talented” who inhabit a casteless, democratic, and meritorious norm threatened by reservations.In 2011, it was Indiresan who took the Indian government to court challenging the constitutional validity of the 2006 OBC quota. Given the caste history of the region, the make-up of students and faculty, and the strident opposition to reservations, it is no wonder that IIT Madras is such a lightning rod for caste critique. Of course, accusing low castes of politicizing caste is not new. When those who have borne the brunt of caste discrimination expose structural inequality and demand redress, they are accused of casteism. For simply naming the unspoken status quo, they are accused of being divisive, hateful, and anti-egalitarian. Meanwhile, the beneficiaries of caste privilege claim to be defending nothing less than equality and merit itself. Democratic rhetoric, it seems, has become the favored language of anti-democratic politics. From the outpouring of support for the APSC, it is clear that this doublespeak does not convince everyone. 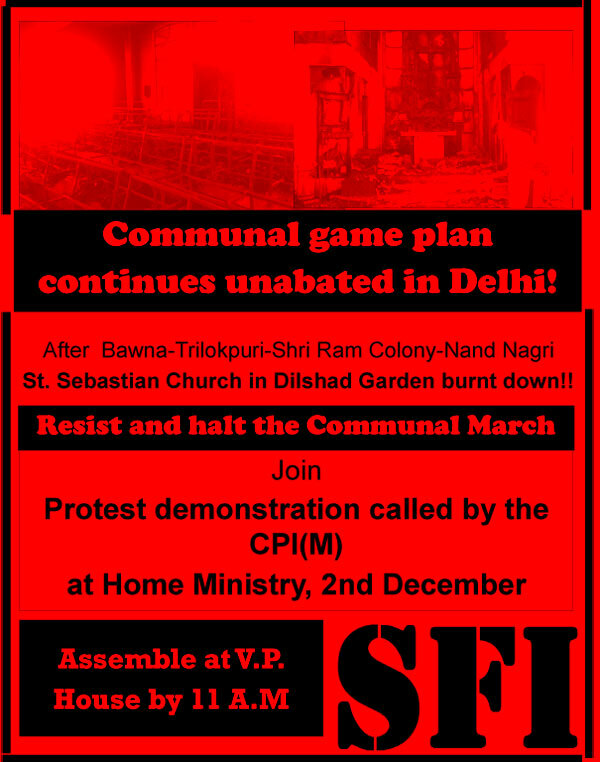 A broad alliance of Left, OBC, SC, and student groups arecurrently engaged in sustained direct action in solidarity with the embattled organization. And their efforts have borne fruit: on June 7th, the Director of IIT Madras reinstated the APSC. Most heartening, however, is theproliferation of new APSCs across Indian college campuses, a clear sign that student dissent is alive and well. Ajantha Subramanian, Professor of Anthropology at Harvard University, is the author of Shorelines: Space and Rights in South India (2009) and most recently, “Making Merit: The Indian Institutes of Technology and the Social Life of Caste,” Comparative Studies in Society and History (2015).